Sam Dreben was born in 1878 in Poltava, Ukraine, Russia. He arrived in the United States in 1899. He settled in Philadelphia, where some of his relatives lived. In 1899, Sam Dreben joined Company G of the 14th Infantry fighting in the Philippines. His salary was $15 a week, a uniform, and three free meals per day. In 1900, during the Boxer Rebellion, Dreben’s infantry company headed to China. After the fighting ended, he returned to the United States. He took a job as a municipal rat catcher in San Francisco, California. Around 1904, Dreben reenlisted, joining the 29th Infantry in Nicaragua and Panama. Following this tour of duty, Dreben joined General Lee Christmas to fight in the Guatemalan revolution. There, Dreben met his life-long friend Tracy Richardson. 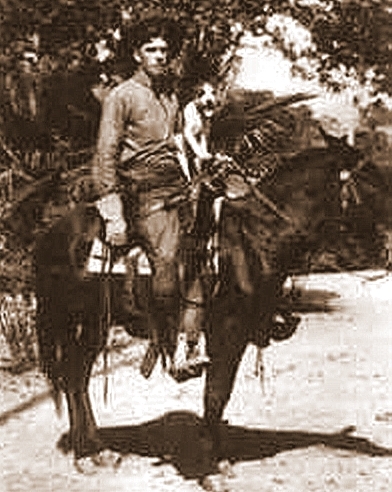 During the Mexican revolution, Sam Dreben lived in El Paso, Texas. Sam Dreben while serving his country. He joined the 141st Infantry, Company A. In 1913, he fought at Pancho Villa‘s side. In 1916, Dreben discontinued his alliance to Villa and joined General John Pershing’s campaign. Dreben briefly returned to civilian life in 1917. Then, World War I caught his attention and he reenlisted with the 141st Regiment of the 36th Infantry. 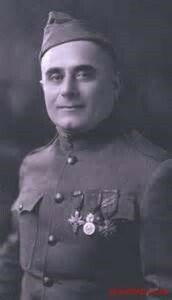 In 1918, Sergeant Sam Dreben earned the American Distinguished Service Cross, the French Croix de Guerre, the Medaille Millitaire, and the Italian War Cross. In 1921, he was chosen to be a part of the Honor Guard at the burial of the Unknown Soldier in Arlington National Cemetery. Dreben moved to Los Angeles in 1923 with his second wife. He worked for the West Coast Life Insurance Company. Sam Dreben married Helen Spence (b.1898) in 1917 in El Paso, Texas. They had one daughter, who died in infancy while Dreben was fighting in World War I.
Sam and Helen divorced in 1919. Sam Dreben married his second wife, Meade Andrews, in 1923. Sam Dreben died in 1925 in Los Angeles, California due to a medical error. He is buried in the Grand View Memorial Park in Glendale (Section M, Lot 270, Grave 7). When Sam Dreben died, the Texas legislature shut down for the day, flying its flags at half-staff to honor the highly decorated soldier. He achieved the rank of 1st Sergeant. Martin Zielonka, “San Dreben, D.S.C. : The Fighting Jew, 1878-1925,” Western Staes Jewish History 44/1. Samatha Silver is the curator for this Sam Dreben exhibit.